The weather has been incredible here in El Paso yet again so it’s time for me to grab a Guayacan Sabor de Esteli Maduro and head out back for a smoke. The being said, I have a cast on my left arm so getting my normal angles for my photographs is pretty much impossible, so please forgive me. Skateboarding accident, but it comes off soon! 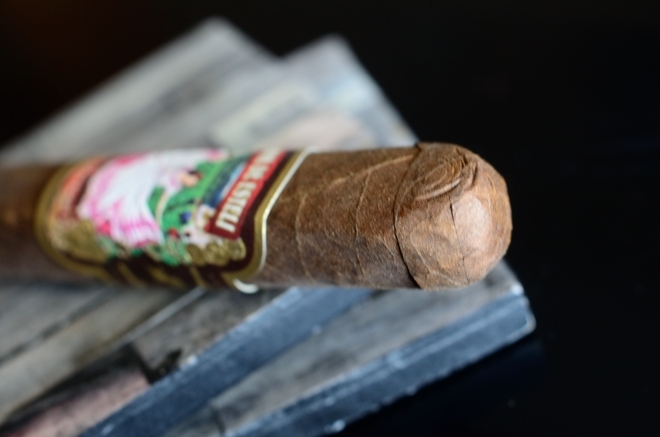 The Guayacan Sabor de Esteli is a tribute to Nicaragua’s cigar making capital Esteli which made its debut at the 2014 IPCPR show in Las Vegas. The Sabor de Esteli line are produced by Noel Rojas, at Rojas’ Aromas de Jalapa factory in Nicaragua. 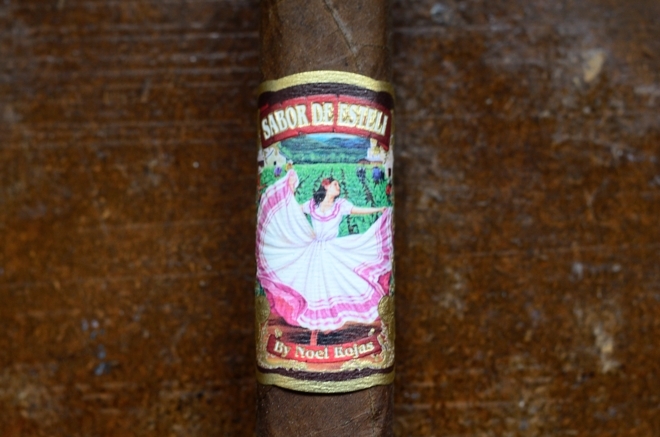 The Sabor de Esteli features a Nicaraguan binder fan filler while the Natural version showcases an Ecuadorian Habano wrapper and the Maduro carries a Mexican San Andreas wrapper. Both lines are offered in three different sizes, the natural features a standard round format while the maduro sports box-pressed formats: The Toro (6 x 52), Gordo (6 x 60), Robusto (5 x 50), and the an additional limited edition Corona (6.5 x 42) which is only offered int he Natural. Prices range between $8 and $9.50 for boxes of 20. 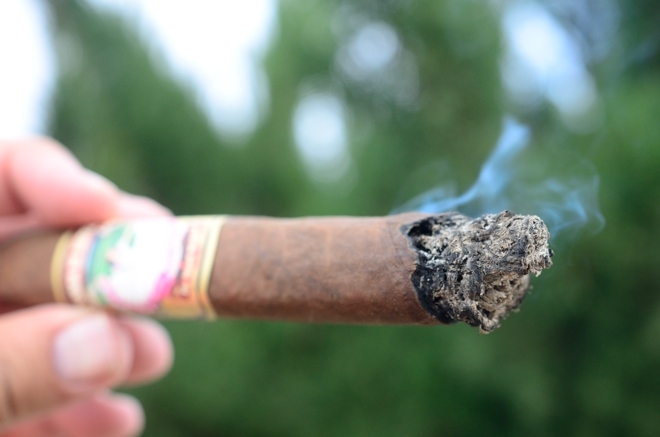 The wrapper on the Sabor de Esteli is really thick and dense sporting lots of tooth and a few larger veins. The wrapper is a deep brown in color and extremely consistent with the exception of a small area around the cap. 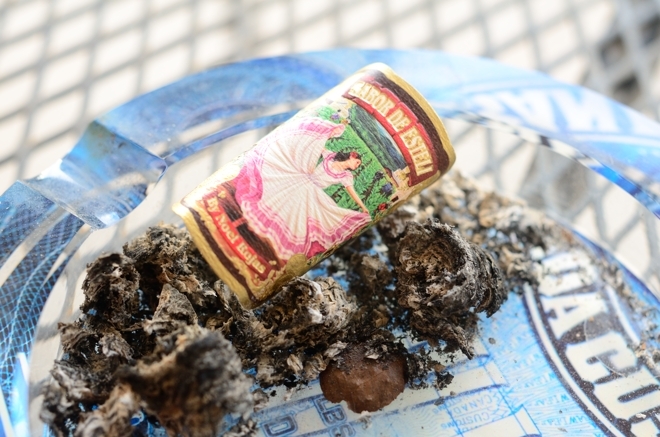 The Sabor de Esteli’s long, thin, boxpressed body leading up to a round double cap which in both samples I received, were affixed quite loosely. 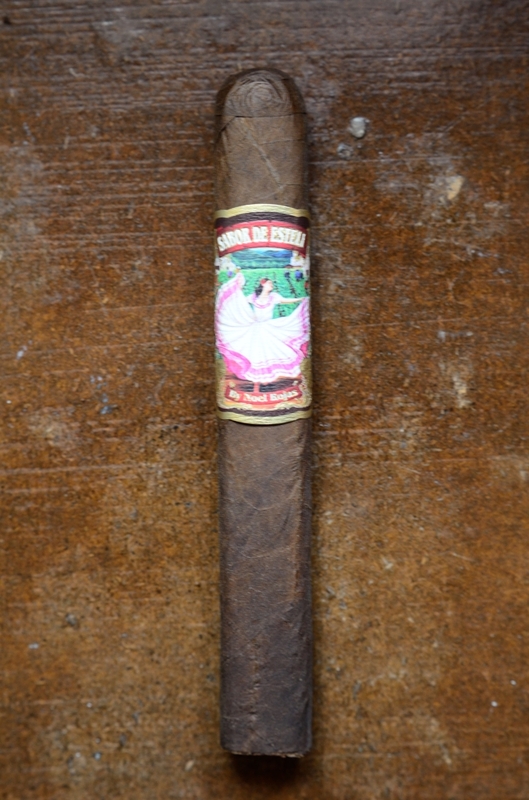 The Sabor de Esteli has a very nice, painting type band that features a woman in a tobacco field which actually comes off very easily despite the size of it. I always hate when cigars carry massive bands with tons of glue which ultimately comes off on the wrapper leaf. Luckily we are good there. Outside of the loose cap the cigar is very well constructed and quite firm as I squeeze it between my fingers. 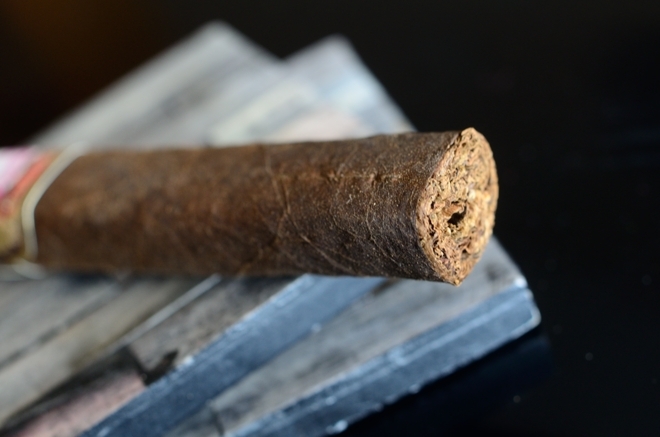 The wrapper gives off lots of spice and cedar while the foot gives off some strong pepper, tobacco, and wood aromas. The cap cut clean but the remainder was so loosely laid on the cigar that it come off on my lips once I put the cigar in my mouth. The cold draw produces some real nice plum, spice, and oak. Right off the bat the Sabor de Esteli stats off with some potent peppers and spice. Once the black pepper began to fizzle out the spice gained more grand backed by some plum, sweetness, brown sugar, natural tobacco and lots of deep oakiness and a sharp tartness on the finish. The draw is awesome, each little puff kicks out a good amount of thin smoke. The burn line is a bit wavy, but manageable while the ash is almost black and very, very thin and flaky only holding on for about a half inch before falling into my lap. Be aware of that. That tartness has been rocking the flavor department in the Sabor de Esteli. The backing flavors are still a deep oakiness, plum, and spice while the sweetness has completely disappeared. The retrohale showcases some really strong pepper and spice with a bit of that oak on the aftertaste. The burn line is still a bit wild, but I haven’t had to reach for my lighter quite yet. I close out the second third feeling nothing in the nicotine department. Man the tart flavor is really taking over this experience as I venture into the final third of the Guayacan Sabor de Esteli Maduro. Outside of the tartness there is some good spice, coffee, oak, and natural tobacco flavors. The burn lines has been while the whole time but with only one or two touch ups, I’m not complaining. 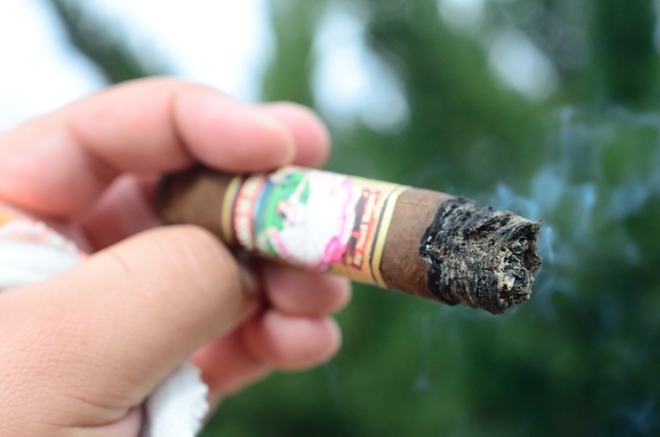 The Sabor de Esteli Maduro took me almost two hours to take down and I experienced only some minor harshness at the end, and not heat down to the nub. The Guayacan Sabor de Esteli is a good cigar, but it does have it’s nuances. First, that tartness was a bit much for me. While that’s strictly subjective something that isn’t is the massive amounts of sap that built up on both samples I smoked. The sap appeared a little more than halfway end requiring me to frequently clip the cap to get rid of it. Some time in the humidor may do wonders for this cigar as the tartness would mellow out and the sap would be absorbed. I’ve smoked and loved the natural version of this cigar and at this point would recommend that one over this cigar, but I’ll have to revisit this one in a few months to see how it shapes up with a bit of age. This was a another moment where as soon as I lit up the Guayacan Sabor Esteli I knew exactly what I wanted to pair it with. 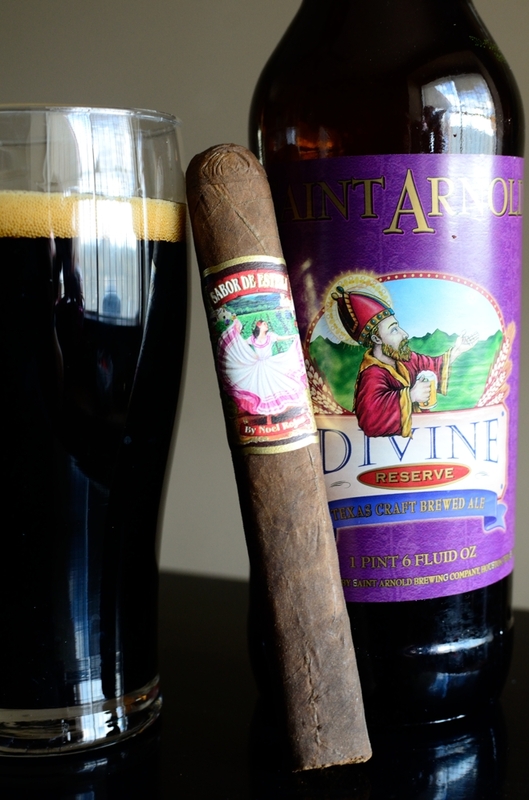 Saint Arnold’s Divine Reserve 15 is the 15th installment in the divine reserve series. Each year Saint Arnold pumps out a different limited edition style and this year the Divine Reserve features a 10.1% Imperial Stout. The Divine Reserve leads with spice, chocolate and malt with a very heavy mouthful, lots of chocolate and sweetness and tons of creaminess. The flavors in this beer marry up perfectly with the flavors of the Sabor de Esteli Maduro. 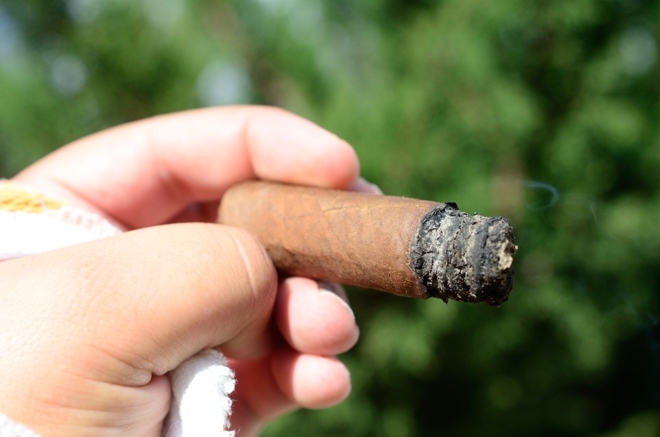 I could see this cigar paired with some black coffee all day, sweet tea, or a strong porter.